El uso de prácticas socio-técnicas se menciona como un indicador de satisfacción de los colaboradores dentro de la organización. La implementación de prácticas del Lean Manufacturing también se considera como un aspecto importante para la mejoría del desempeño en cuanto a calidad y reducción de costos. Este artículo tiene como propósito identificar el efecto moderador de la aplicación de prácticas just-in-time sobre la relación entre las prácticas socio-técnicas y el desempeño de calidad de salud de los colaboradores en empresas con implementación Lean. Se desarrolló una investigación con 144 empresas del sur de Brasil en proceso de implementación Lean. Los resultados indican que las prácticas socio-técnicas presentan relación significativa con el desempeño de la empresa en calidad y salud de los colaboradores, y la implementación de prácticas just-in-time no perjudica el desempeño de estos indicadores en las empresas. Arezes, P., Carvalho, D., Alves, A. (2010). Threats and opportunities for workplace ergonomics in lean environments. In 17th International Annual EurOMA Conference-Managing Operations in Service Economics. EurOMA. Arezes, P., Dinis-Carvalho, J., Alves, A. (2015). Workplace ergonomics in lean production environments: A literature review. Work, 52(1), 57-70. Armstrong, J., Overton, S. (1997). Estimating nonresponse bias in mail surveys. Journal of Marketing Research, 14(3), 396-402. Asadzadeh, S., Azadeh, A., Negahban, A., Sotoudeh, A. (2013). Assessment and improvement of integrated HSE and macro-ergonomics factors by fuzzy cognitive maps: The case of a large gas refinery. Journal of Loss Prevention in the Process Industries, 26(6), 1015-1026. Azadeh, A., Rouzbahman, M., Saberi, M., Valianpour, F. (2014). An adaptive algorithm for assessment of operators with job security and HSEE indicators. Journal of Loss Prevention in the Process Industries, 31, 26-40. Backstrand, G., Bergman, C., Hogberg, D., Moestam, L. (2013). Lean and its impact on workplace design. Proceedings of NES 45th Nordic Ergonomics & Human Factors Society Conference, Iceland. Baron, R., Kenny, D. (1986). The moderator–mediator variable distinction in social psychological research: conceptual, strategic, and statistical considerations. Journal of Personality and Social Psychology, 51(6), 1173-1182. Beevis, D. (2003). Ergonomics: cost and benefits revisited. Applied Ergonomics, 34, 491-496. Blaikie, P., Cannon, T., Davis, I., Wisner, B. (2014). At risk: natural hazards, people's vulnerability and disasters. Routledge. Boyle, T., Scherrer-Ratheje, M., Stuart, I. (2011). Learning to be lean: the influence of external information sources in lean improvements. Journal of Manufacturing Technology Management, 22(5), 587-603. Carayon, P. (2006). Human factors of complex sociotechnical systems. Applied Ergonomics, 37(4), 525-535. Carayon, P., Smith, M. (2000); Work organization and ergonomics. Applied Ergonomics, 31, 649-662. Cleggl, C. (2000). Sociotechnical principles for system design. Applied Ergonomics, 31, 463-477. Drew, F., Picciano, P., Agutter, J., Syroid, N., Westenskow, D., Strayer, D. (2007). Development and evaluation of a just-in-time support system. Human Factors, 49(3), 543-551. Dul, J., Neumann, W. (2009). Ergonomics contributions to company strategies. Applied Ergonomics, 40(4), 745-752. Eklund, J. (2000). Development work for quality and ergonomics. Applied Ergonomics, 31(6), 641-648. Eren, T. .(2009).Human and machine effects in a just-in-time scheduling problem. Human Factors and Ergonomics in Manufacturing, 19(4), 294-299. Ferreira, L., Gurgueira, G. .(2013). Ergonomia como fator econômico no pensamento Enxuto: uma análise crítica bibliográfica. Gepros: Gestão da Produção, Operações e Sistemas, 8(3), 39-49. Genaidy, A., Karwowski, W. .(2003).Human performance in lean production environment: Critical assessment and research framework. Human Factors and Ergonomics in Manufacturing & Service Industries, 13(4), 317-330. Goldsby, T., Knemeyer, A., Miller, J., Wallenburg, C. .(2013). Measurement and moderation: finding the boundary conditions in logistics and supply chain research. Journal of Business Logistics, 34(2), 109-116. Guimarães, L., Anzanello, M., Ribeiro, J., Saurin, T. .(2015). Participatory ergonomics intervention for improving human and production outcomes of a Brazilian furniture company. International Journal of Industrial Ergonomics, 49, 97-107. Gunasekaran, A., Goyal, S., Martikainen, T., Yli-Olli, P. .(1998). A conceptual framework for the implementation of zero inventory and just-in-time manufacturing concepts. Human Factors and Ergonomics in Manufacturing, 8(1), 63-78. Hagg, G. (2003). Corporate initiatives in ergonomics: an introduction. Applied Ergonomics, 34, 3-15. Hair, J., Tatham, R., Anderosn, R., Black, W. (2006). Multivariate data analysis. Pearson Prentice Hall, Upper Saddle River, NJ. Haug, A. .(2015). Work instruction quality in industrial management. International Journal of Industrial Ergonomics, 50, 170-177. Hoffmeister, K., Gibbons, A., Schwatka, N., Rosecrance, J. (2015). Ergonomics climate assessment: a measure of operational performance and employee well-being. Applied Ergonomics, 50, 160-169. Jackson, P., Martin, R. .(1996). Impact of just-in-time on job content, employee attitudes and well-being: a longitudinal study. Ergonomics, 39(1), 1-16. Jaworek, M., Marek, T., Karwowski, W., Andrzejczak, C., Genaidy, A. (2010). Burnout syndrome as a mediator for the effect of work-related factors on musculoskeletal complaints among hospital nurses. International Journal of Industrial Ergonomics, 40(3), 368-375. Joseph, B. (2003). Corporate ergonomics programme at Ford Motor Company. Applied Ergonomics, 34, 23-28.9. Kang, J., Zhang, J., Gao, J. (2016). Improving performance evaluation of health, safety and environment management system by combining fuzzy cognitive maps and relative degree analysis. Safety Science, 87, 92-100. Karsh, B., Waterson, P., Holden, R. (2014). Crossing levels in systems ergonomics: a framework to support ‘mesoergonomic’ inquiry. Applied Ergonomics, 45(1), 45-54. Karwowski, W., Salvendy, G., Badham, R., Brodner, P., Clegg, C., Hwang, S., Lamarsh, J. (1994). Integrating people, organization, and technology in advanced manufacturing: a position paper based on the joint view of industrial managers, engineers, consultants, and researchers. International Journal of Human Factors in Manufacturing, 4(1), 1-19.9. Koukoulaki, T. (2010). New trends in work environment–New effects on safety. Safety Science, 48(8), 936-942. Koukoulaki, T. (2014). The impact of lean production on musculoskeletal and psychosocial risks: an examination of sociotechnical trends over 20 years. Applied Ergonomics, 45, 198-21. Langstrand, J. (2012). Exploring organizational translation: a case study of changes toward lean production. Doctoral Thesis, Linköping University, Department of Management and Engineering, Quality Technology and Management. Liker, J. (2006).The Toyota way fieldbook. New York, McGrawHill. Liker, J., Houses, M. (2006). Toyota culture. New York, McGrawHill. Maia, L., Alves, A., Leão, C. .(2012). Design of a lean methodology for an ergonomic and sustainable work environment in textile and garment industry. Proceedings of ASME International Mechanical Engineering Congress and Exposition, Houston, Texas, USA. Marodin, G., Frank, A., Tortorella, G., Saurin, T. (2016). Contextual factors and Lean Production implementation in the Brazilian automotive supply chain. Supply Chain Management: An International Journal, 21(4). Meyers, L., Gamst, G., Guarino, A. (2006). Applied Multivariate Research, Sage Publications, Thousand Oaks. Molleman, E., Broekhuis, M. (2001). Sociotechnical systems: towards an organizational learning approach. Journal of Engineering Technology Management, 18, 271-294. Netland, T., Ferdows, K. (2014). What to expect from a corporate lean program. MIT Sloan Management Review, 55(3), 83-89. Pavlovic-Veselinovic, S., Hedge, A., Veselinovic, M. (2016). An ergonomic expert system for risk assessment of work-related musculo-skeletal disorders. International Journal of Industrial Ergonomics, 53, 130-139. Plonka, F. (1997). Developing a lean and agile work force. Human Factors and Ergonomics in Manufacturing & Services Industries, 7(1), 11-20. Rahul, P., Ravindran, M., Sarvesh, S., Rajesh, D. (2014). Cycle time reduction in assembly line through layout improvement, ergonomics analysis and lean principles. International Journal of Applied Science and Engineering Research, 3(2), 455-463. Saurin, T., Ferreira, C. (2009). The impacts of lean production on working conditions: a case study of a harvester assembly line in Brazil. International Journal of Industrial Ergonomics, 39, 403-412. Saurin, T., Ribeiro, J., Marodin, G. (2010). Identification of research opportunities based on a survey on lean production implementation conducted in Brazilian and foreign companies. Gestão & Produção, 17(4), 829–841. Seppala, P., Klemola, S. (2004). How do employees perceive their organization and job when companies adopt principles of lean production?. Human Factors and Ergonomics in Manufacturing & Service Industries, 14(2), 157-180. Shah, R., Ward, P. (2003). Lean manufacturing: context, practice bundles, and performance. Journal of Operations Management, 21, 129-149. Shah, R., Ward, P. (2007). Defining and developing measures of lean production. Journal of Operations Management, 25(4), 785-805. Sharma, R. (2012). Conceptual framework for improving business performance with lean manufacturing and successful human factors interventions–a case study. International Journal for Quality Research, 6(3), 259-270. Silva, M., Tortorella, G., Amaral, F. (2016). Psychophysical demands and perceived workload—an ergonomics standpoint for lean production in assembly cells. Human Factors and Ergonomics in Manufacturing & Service Industries, (forthcoming). Tabachnick, B., Fidell, L. (2013). Using Multivariate Statistics, 5ª ed., Pearson, Upper Saddle River, NJ. Thun, J., Lehr, C., Bierwirth, M. (2011). Feel free to feel comfortable—an empirical analysis of ergonomics in the German automotive industry. International Journal of Production Economics, 133(2), 551-561. Toralla, P., Falzon, P., Morais, A. (2011). Participatory design in lean production: which contribution from employees? For what end?. Work, 41, 2706-2712. Tortorella, G., Marodin, G., Fettermann, D., Fogliatto, F. (2016). Relationships between lean product development enablers and problems. International Journal of Production Research, 54(10), 2837-2855. Tortorella, G., Marodin, G., Miorando, R., Seidel, A. (2015). The impact of contextual variables on learning organization in firms that are implementing lean: a study in Southern Brazil. The International Journal of Advanced Manufacturing Technology, 78(9-12), 1879-1892. Tortorella, G., Vergara, L., Ferreira, E. (2016). Lean manufacturing implementation: an assessment method with regards to socio-technical and ergonomics practices adoption. The International Journal of Advanced Manufacturing Technology, (forthcoming). Wilson, R. Guarding the line: score big by planning for worker safety while you implement lean. Industrial Engineer, 37(4), 46-50.(2005). Womack, S., Armstrong, T., Liker, J. (2009). Lean job design and musculoskeletal disorder risk: a two plant comparison. Human Factors and Ergonomics in Manufacturing & Service Industries, 19(4), 279-293. Womack, J., Jones, D. (2010). Lean thinking: banish waste and create wealth in your corporation. Simon and Schuster. Zare, M., Croq, M., Hossein-Arabi, F., Brunet, R., Roquelaure, Y. (2016). Does ergonomics improve product quality and reduce costs? A review article. Human Factors and Ergonomics in Manufacturing & Service Industries, 26(2), 205–223. Esta obra está bajo licencia internacional Creative Commons Reconocimiento 4.0. Cuadernos de Administración se encuentra registrada bajo la licencia Creative Commons Reconocimiento 4.0 Internacional. 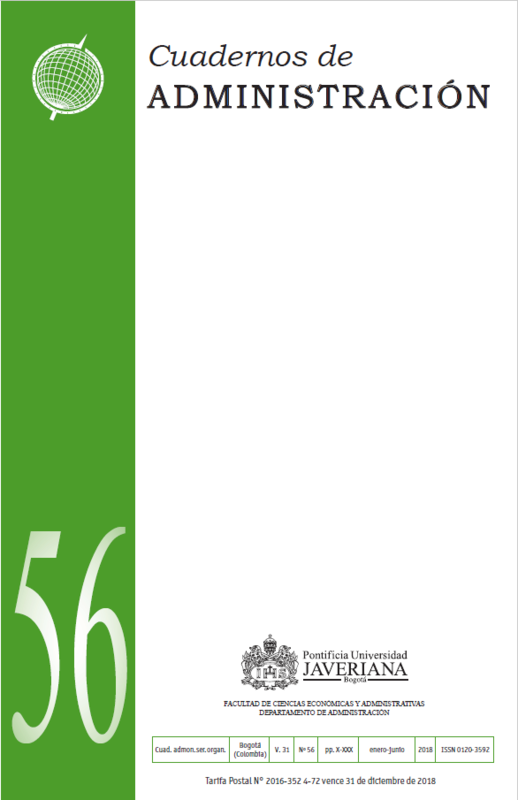 Por lo tanto, esta obra se puede reproducir, distribuir y comunicar públicamente en formato digital, siempre que se reconozca el nombre de los autores y a la Pontificia Universidad Javeriana. Se permite citar, adaptar, transformar, autoarchivar, republicar y crear a partir del material, para cualquier finalidad (incluso comercial), siempre que se reconozca adecuadamente la autoría, se proporcione un enlace a la obra original y se indique si se han realizado cambios. La Pontificia Universidad Javeriana no retiene los derechos sobre las obras publicadas y los contenidos son responsabilidad exclusiva de los autores, quienes conservan sus derechos morales, intelectuales, de privacidad y publicidad.